After a trying and rather stressful morning, nothing brings me back to me than my writing. I feel truly blessed that I have been given a gift that I can share with others. I know that I'm not the greatest writer alive (or dead). All I hope is that my words, no matter what they focus on, are able to reach someone else out there who may really need to hear them. My focus and thoughts have been filled with having to help some very important people to me through some extremely tough times. The understanding that I only have what's within my personal power to help them has to be the most difficult part. It's heart-breaking to watch someone you care so much about choosing to go down a dark path. All I can do is hold on to the comfort that they have my love, support and pearls of wisdom to take with them that will, hopefully, help give them the strength to change their direction. That being said, I thought that this oldie but goodie story I wrote years ago was suiting to today's segment focus. I'd been writing for years before this story but after it won first prize in a writing contest, one of the editors wrote to tell me to get it published. It sold the next week. It's a simple, but true story from my youth about my friendship with a wonderful old man I took the bus with every morning. We never even knew each other's names, but he gave me two things I so desperately needed at the time: (a) the gift of unconditional kindness, and (b) his open heart and ears. Sometimes, when a person is at their lowest, feeling at their most desperate, that one person who listens...just listens...is all it takes to re-ignite the self-worth they lost touch with. So, I'm sharing this story with you today with the hope it brings you some of the same joy I had in writing it. And I hope for those who may be struggling out there, know that for some unexplainable reason, as I found out, that one special person will be brought to you when you need them the most. Always be kind to strangers, Chynna. You never know the power of a simple act of kindness. My grandparents were the wisest people I knew. I never questioned anything they told me when I was a child, even if what they said made no sense to me at the time. For example, I found being ‘kind to strangers’ a confusing concept considering in the earlier part of my life I was taught not to even talk to strangers. But I was given a powerful lesson behind their tidbit on kindness the year I started Grade Nine. It was the fall of 1984. Although there was no snow on the ground yet, it was quite frosty. I hugged myself and shivered as my breath hung in the air in frozen puffs. “Where is the stupid bus?” I muttered through clenched teeth. I was about to walk up to the next bus stop, which had a bus shelter, when the bus appeared around the corner and zoomed toward the small crowd gathering around me. The passengers filed onto the bus and noisily shuffled to their seats. I sat in the front of the bus, like I always did, to avoid unnecessary conversations with other people. Not only was I total introvert, but I was also not a morning person and often found cheerful conversation so early in the day quite annoying. The driver’s late arrival made him behind schedule, so he left the bus stop as soon as the last person climbed up the stairs. As the bus pulled out onto the main road, I closed my eyes and let my mind wander. A lot had been going on for me that year. My mother had gotten re-married, she was expecting a baby in early October and I’d started ninth grade. I’d had no real friends at school because someone had started a rumor that I was the one having a baby, not my mother. Missing a lot of school to help out with family difficulties only fueled the rumors. On top of all that, my biological father had removed himself from my life or so I was led to believe. He’d told my mother that he wouldn’t pay her child support since she’d remarried. Mom said, “No money, no access!” I found out later on the true reasons behind his decision, and forgave him. At the time, though, his disappearance had hurt a lot. And I was consumed with bitterness and anger…about everything. Whatever. I thought back then. Good riddance. The bus stopped suddenly, jerking me out of my daydream, and I almost fell forward out of my seat. Out of the window on the opposite side of the bus, I saw the top of a gray felt hat. The hat moved slowly toward the door of the bus and my gaze followed it. The hat rose as the elderly man wearing it clumsily climbed each stair. His body was bent forward in a question mark shape, which made it very difficult for him to climb the stairs with any great speed. Hurry up! I thought with irritation. We’re late enough already! After he paid his fare, the man looked right at me as if he knew who I was. A cold shiver raced through my veins. He shuffled slowly towards me. “Excuse me, young lady. May I sit here?” he asked, motioning beside me. “Thank you,” he said. Then he lowered himself down and adjusted himself in the seat. Like the gentlemen of his era, he removed his hat and placed it in his lap. I smiled and looked out the window. Great. Now he’s going to want to chat. “I don’t like cold weather,” I answered, still looking out the window. His eyes were a deep, dark brown and filled me with a comforting warmth just looking into them. His hair was silver with sprinkles of black here and there. He barely had any wrinkles, except when he’d smiled. Then deep furrows emerged around his mouth and eyes. I guessed he probably smiled a lot. He kept one hand on his hat while using the other to enunciate his words as he spoke. “I’m sorry, I didn’t hear what you just said,” I said softly. He’d been talking to me while I studied his face. “I asked if you were on your way to school,” he laughed. I looked down solemnly and he put his hand on my knee. “Oh, young lady. These days should be the happiest you’ll ever have. You are too young to have such sadness in your heart. Focus on what makes you happy and things will work themselves out, no?” With that he smiled again. Normally, I would have thought, “What a cheeseball!” But his words touched my heart. I hadn’t felt appreciated in such a long time. It was as though he knew how lonely I’d been. That marked the first of many bus rides together. Every day he got on the bus and sat beside me. He never lectured me or talked down to me. He just listened and offered me his kind words. A month before school ended, he said something to me I didn’t pay much attention to at the time. I looked at him, his eyes rimmed with tears. With that, he touched the side of my face and I got off the bus. On Monday, I looked out the window when the bus got to the man’s stop but I didn’t see his hat. Maybe he’s just sick today. I thought. But the seat beside me remained empty right up until the very last day of school. My heart ached that day as I looked down at the folded letter in my hand thanking him for his kindness to me throughout that difficult year. We didn’t even know each other’s names, but he made a lasting impression on me. He came into my life during a time when all I really needed was someone just to listen to me. He gave me a gift very few others have ever given to me: true kindness. And I’m so grateful to him. My grandparents were right. The kindness of strangers can be very powerful. 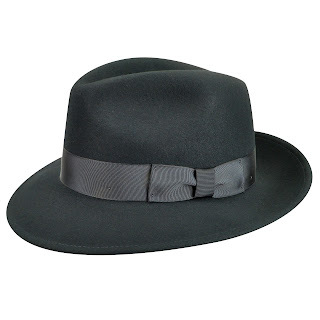 To this day whenever I see a gray felt hat, I smile to myself with a tear in my eye and warmth in my heart. And I always leave the seat beside me on the bus open in case someone wants or needs to sit and chat.